Lately I’ve been stocking up on some great dresses and sandals for summer, but haven’t thought twice about loading up on essential accessories. I sometimes tend to forget about the details when shopping, always going for the big-ticket items. This season I am choosing to do things differently. There are a few key items I need to purchase and I thought I share the front runners with you! Sleek Watches // I have a couple of really nice watches by Michele that were given to me by my dad and grandmother in high school and college, but during the summer I am worried about ruining or losing such a nice piece while traveling a ton. There are some really chic watches out there right now that are much cheaper which I’d be much more comfortable traveling with. This black and gold Michael Kors watch is at the top of my list right now. It’s so simple and sleek, don’t you think? I feel like it would actually be a wonderful year-round option too because of the versatile color. Michael Kors really does know how to do watches – I also love his more vibrant options like this gold watch with an orange face (or this turquoise option). Summer vibes all the way. Finally, Michele has created a white jelly-watch option (available with a gold or silver face) that is less expensive and more durable than their gold and silver counterparts. Win, win! Statement Clutches // While I am lucky to have a pretty solid collection of handbags, I’m really lacking in the clutch department. I don’t know why, but for some reason I have a much harder time spending money on a clutch than I do pulling the trigger on a big bag. Anyone else have that issue? Anyway, I’ve been on the lookout for some fun summer clutches and think I’ve found some contenders. This orange-red acrylic Tory Burch clutch would be a fab addition to my closet this summer to wear with little white dresses, but I also love this iridescent Milly clutch. Both are so bright and happy, right? I’m also a huge fan of Charlotte Olympia’s statement clutches, specifically this handcuffed one. It’s all in the details! Thick Frames + Reflective Lenses // As far as eyewear goes, I’m really into thick-framed sunglasses and reflective lenses. There’s something about a reflective lens that just screams summer! This pair by BCBG is under $100, but I can’t stop thinking about this pair by Wildfox. They’re a little more subtle. Finally, I have this pair of Prada sunnies in black but the white pair has me desperate for another pair. Is it ridiculous to get the same pair in a different color way? I think no. This post was sponsored by Nordstrom, but all thoughts and opinions are my own! I want that black MK watch it is so sleek, as far as Sunnies today I will be checking Gilt because they are having and Elizabeth and James eyewear sale. great picks! Great picks! Love that scarf! I am typically not a big accessorizer or watch lover but I absolutely love that Michael Kors watch! And loving that clutch fabric, looks inspired by the pool! I love that Charlotte Olympia clutch! It is so fun! Can I have one of everything please?? I love that striped orange pom pom scarf…perfect for weekends at the beach. Those cat eye sunglasses are so retro chic and that Tory Burch clutch is the ideal shape and color. Great picks! You have the BEST taste in sunglasses! 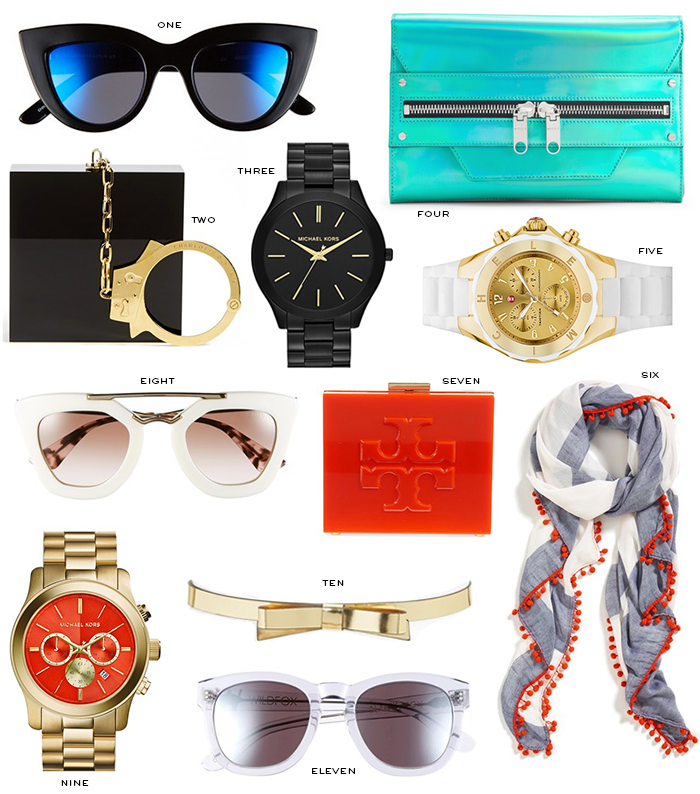 Love all of those sunglasses and that black MK watch. Great picks, as always! During the year I dont usually wear a watch because I always seem to have my phone with me. But when the summer approaches I try to leave my phone behind more often and just enjoy the moment; however this becomes a bit tricky with not knowing the current time. Therefore, I think I need add a watch back into my daily outfits — and that black one would be just perfect! You definitely aren’t alone! I’ll drop thousands of dollars on a big purse but can’t bring myself to pay more than $100 on a clutch. Why?!? I’ll never know, but I love that Charlotte Olympia handcuff number. To paraphrase Ms. Zoe, so maj! Great picks! Love 4,6 and 8!! I am totally obsessed with that pom pom scarf! I have it in an upcoming post too, and I want it in all 4 colors! Can Charlotte Olympia do no wrong? I think not..
I’ve been crushing on that Milly clutch for soooo long. It’s amazing. Love that scarf!! Fun pieces for summer! I love Michael Kors’ watches! He has some great color face options right now! There’s a particularly beautiful pink and orange ombre face watch you would probably adore! Love all the pieces you picked here! I can’t that black watch is AMAZING!! !